Two homeowners have told a New York federal court that Wells Fargo & Co. and Ocwen Financial Corp. illegally collected payments on mortgages they fraudulently declared in default, according to a False Claims Act suit made available Tuesday.Originally filed under seal in September 2014, plaintiffs Mr. and Mrs. Schiano claim the companies diverted a payoff they had made for refinancing their home and told the loan’s owner, government sponsored entity Freddie Mac, that the pair had defaulted. As a result, the suit claims, Freddie Mae only received 80 percent of the payoff of the first mortgage from its insurer, Genworth Financial, while Wells Fargo and Ocwen were able to secure a “double recovery” through the original payoff and subsequent refinancing. 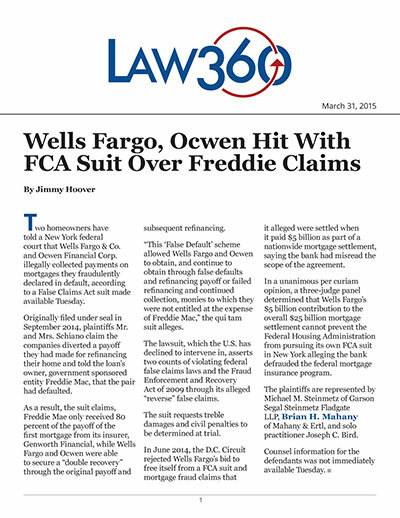 “This ‘False Default’ scheme allowed Wells Fargo and Ocwen to obtain, and continue to obtain through false defaults and refinancing payoff or failed refinancing and continued collection, monies to which they were not entitled at the expense of Freddie Mac,” the qui tam suit alleges. The lawsuit, which the U.S. has declined to intervene in, asserts two counts of violating federal false claims laws and the Fraud Enforcement and Recovery Act of 2009 through its alleged “reverse” false claims. The suit requests treble damages and civil penalties to be determined at trial. In June 2014, the D.C. Circuit rejected Wells Fargo’s bid to free itself from a FCA suit and mortgage fraud claims that it alleged were settled when it paid $5 billion as part of a nationwide mortgage settlement, saying the bank had misread the scope of the agreement. In a unanimous per curiam opinion, a three-judge panel determined that Wells Fargo’s $5 billion contribution to the overall $25 billion mortgage settlement cannot prevent the Federal Housing Administration from pursuing its own FCA suit in New York alleging the bank defrauded the federal mortgage insurance program. The plaintiffs are represented by Michael M. Steinmetz of Garson Segal Steinmetz Fladgate LLP, Brian H. Mahanyof Mahany & Ertl, and solo practitioner Joseph C. Bird. Counsel information for the defendants was not immediately available Tuesday.